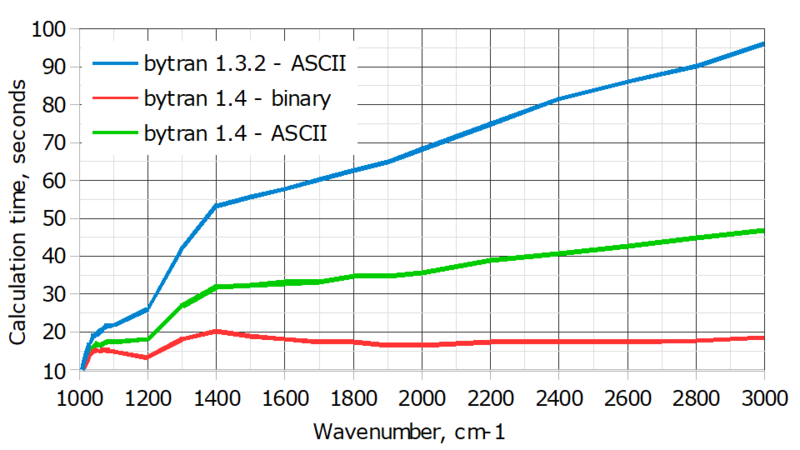 The speed of access to the downloaded HITRAN data will be significantly improved in bytran 1.4 resulting in faster calculation times for wider spectral regions. 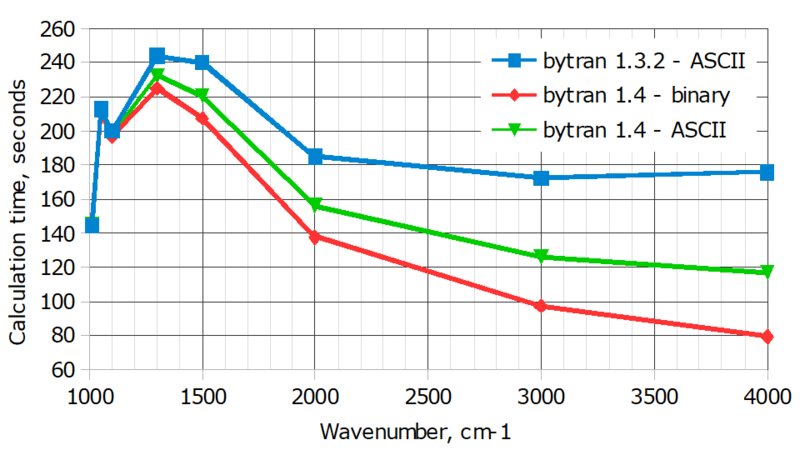 The comparisons below are for calculations with default bytran parameters and a fixed 10000 points wavenumber grid over variable spectral regions beginning at 1000 cm-1 and ending at the wavenumbers specified along the X-axis. 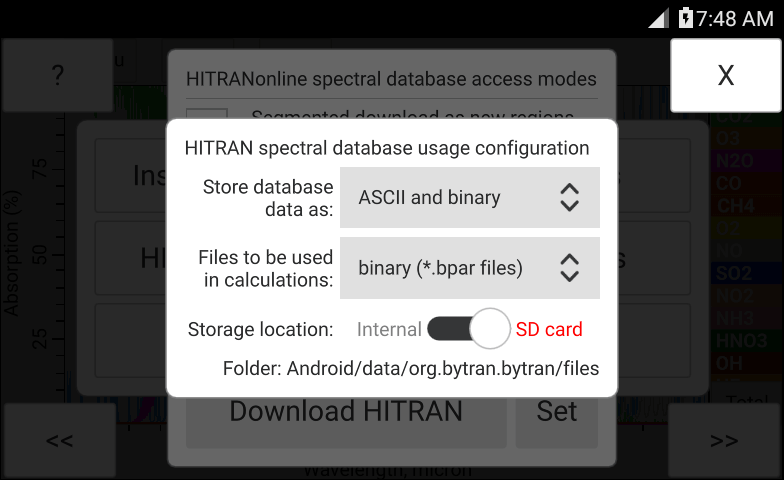 For the highest speed improvement bytran will provide an option to store the downloaded HITRAN data in a binary format resulting in smaller file size and faster disk read times. An option to use a removable SD card for HITRAN database storage will be added. 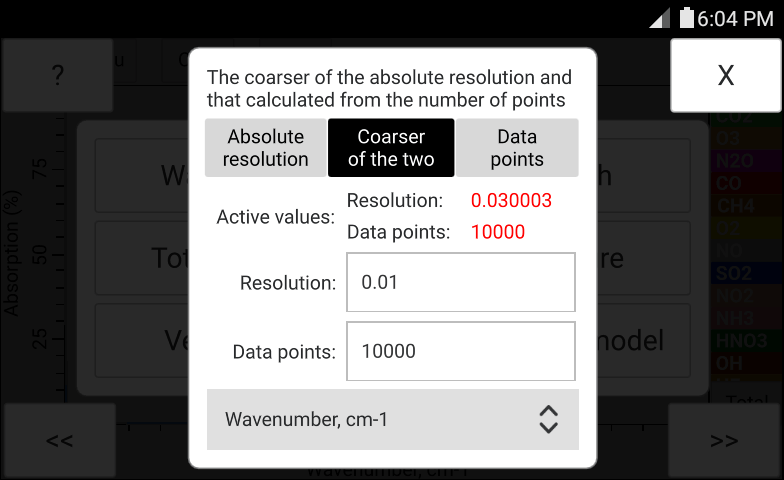 An option to specifiy the wavelength resolution in absolute units or absoltue / data points combination will be introduced to speed up calculations for narrow spectral regions. Android™ 4.3 and above, iOS 8 and above, or Windows 10 (ARM & x64). bytran requests several permissions for its operation under mobile platforms. The Windows Phone version does not offer Image and Data sharing. The serial port profile Bluetooth connectivity used for remote control may not work (or requires additional setup) under Ubuntu and Mac OS. NOTE: Due to the HITRANOnline switch to secure HTTP bytran version 1.3 and below will no longer work. Updated versions 1.3.1 and 1.3.2 have been issued to address this and several other issues found (see change log for more information). Due to some difficulties encountered in linking the secure HTTP libraries under Linux bytran 1.3.2 updates for Linux and the Raspbian operating systems may not be performed or esle issued with the version 1.4 release. Bytran 1.3 now supports the Sense HAT add-on board. 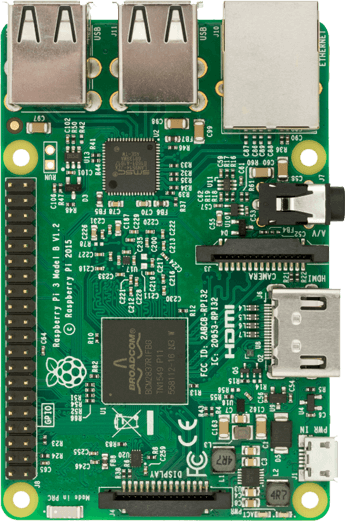 To run bytran under Raspbian (tested on Stretch with Raspberry Pi 3) a script file supplied should be used as outlined in the readme file within the archive. Distributed under the MIT license. Cross-platform source code, written in Qt/C++. Mobile and desktop operating systems supported. Read this note to compile the source code for Raspberry Pi. bytran source code and binary are provided under the terms of the MIT license. The bytran distribution also includes dynamically linked Qt libraries it relies on which are distributed under the LGPL (Version 3) license, more information is available here. Your browser doesn't support HTML5 video in WebM with VP8 or MP4 with H.264. 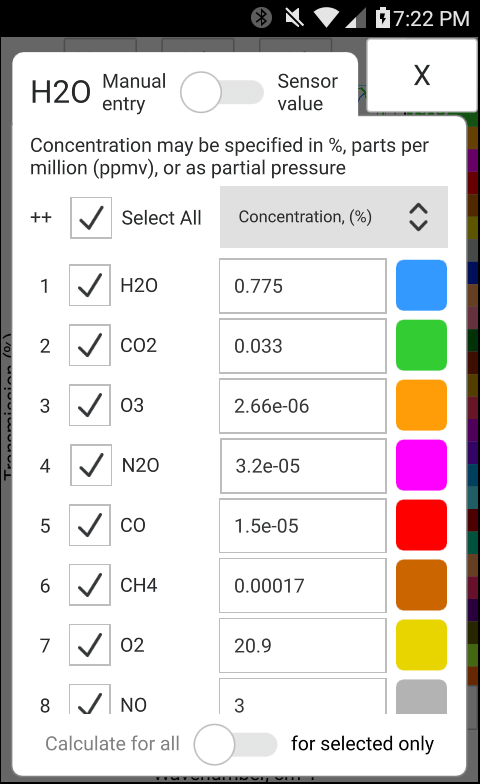 bytran is an application for calculating atmospheric and molecular absorption spectra using the HITRAN database and the line-by-line method. 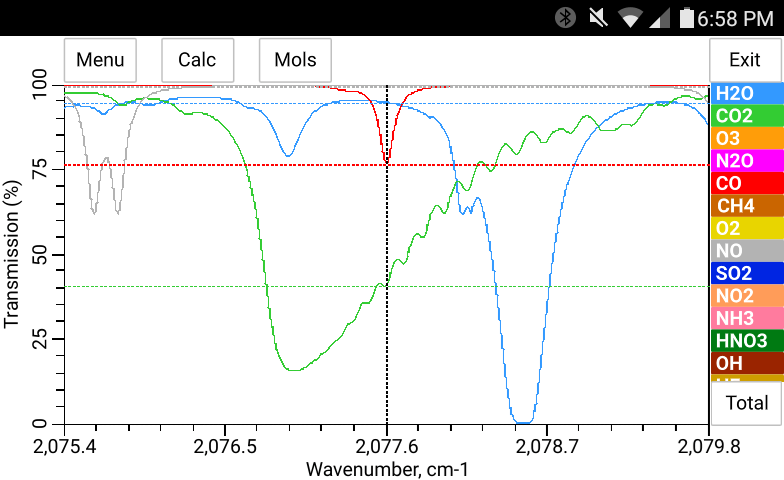 The concentrations of molecules, optical pathlength, total pressure, temperature, and other input parameters are used to model the gas mixture optical transmission spectra as a function of wavelength. 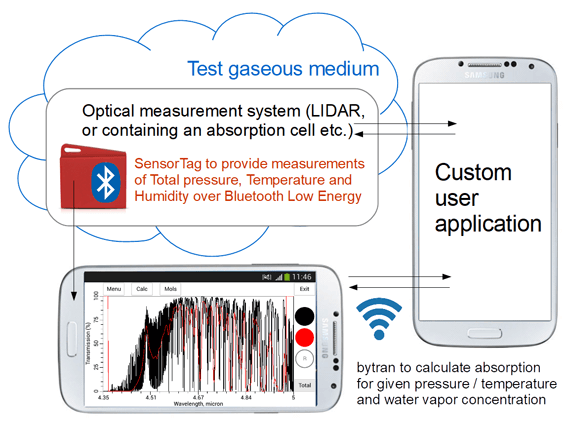 Among other features bytran can be controlled remotely and supports optional usage of SensorTag, Sense Hat, and cell phone sensors for calculations using empirical readings of ambient total pressure, temperature and humidity (H2O vapor concentration) †. For more information read the overview of bytran, the bytran publication and the change log of the bytran releases. 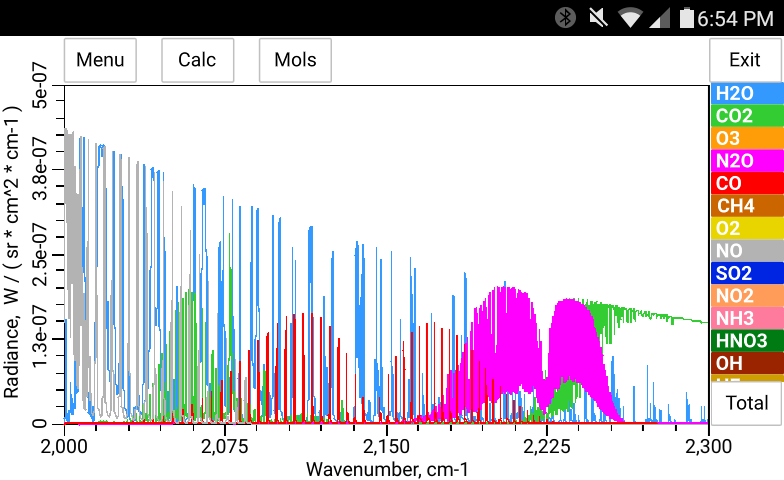 Radiance now viewable as "separate molecules"
† The usage of cell phone sensors is currenly limited to the Android operating system due to the limitations of the Qt environment. 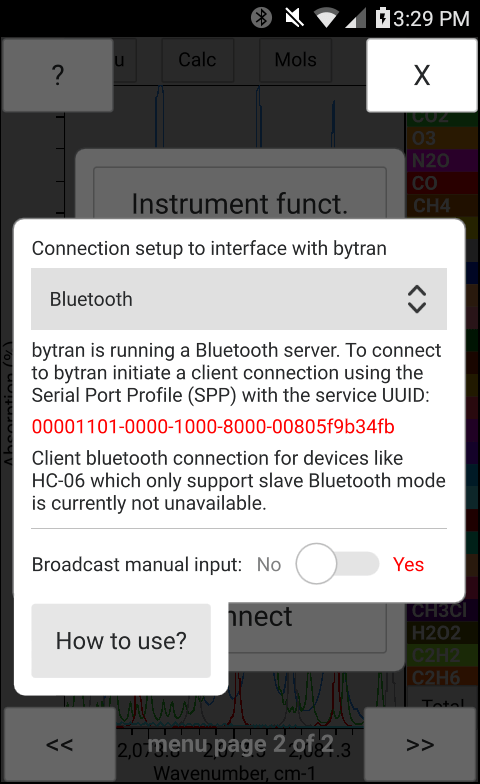 Remote control of bytran may be carried out over classic Bluetooth, WiFi / Ethernet (using WebSockets) or the Serial port. The communication is carried out using the newly introduced bytran communication protocol and enables remote execution, and retrieval of calculation results. 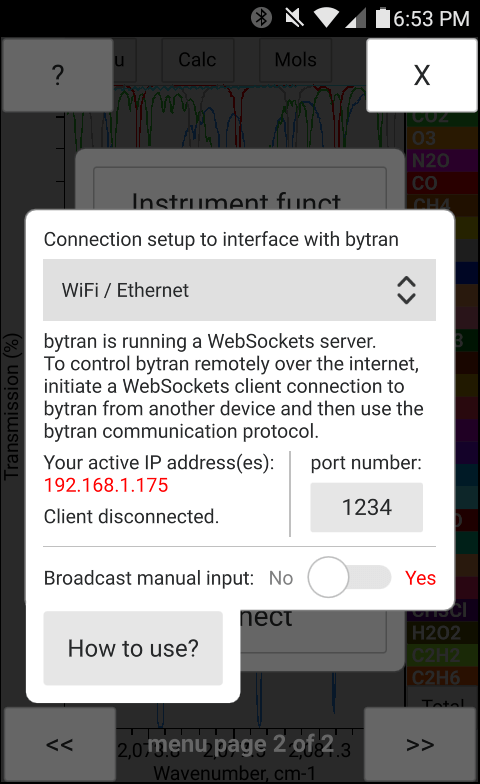 The following links provide information on how to test and use bytran connectivity over Bluetooth, WebSockets, or the Serial Port. SensorTag is a keychain size coin battery operated bluetooth device containing temperature (TMP007 and BMP280, ~ ±1 °C accuracy), pressure (BMP280, ~ ±1 hPa accuracy) and humidity (HDC1000, < 3% accuracy) sensors. 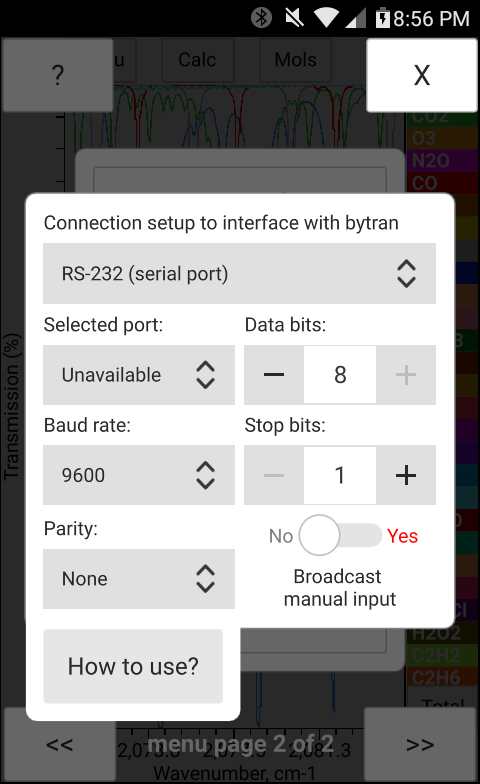 Starting with version 1.2 bytran is able to connect to SensorTag and access its sensors. The SensorTag may be purchased directly from Texas Instruments or its distributors. 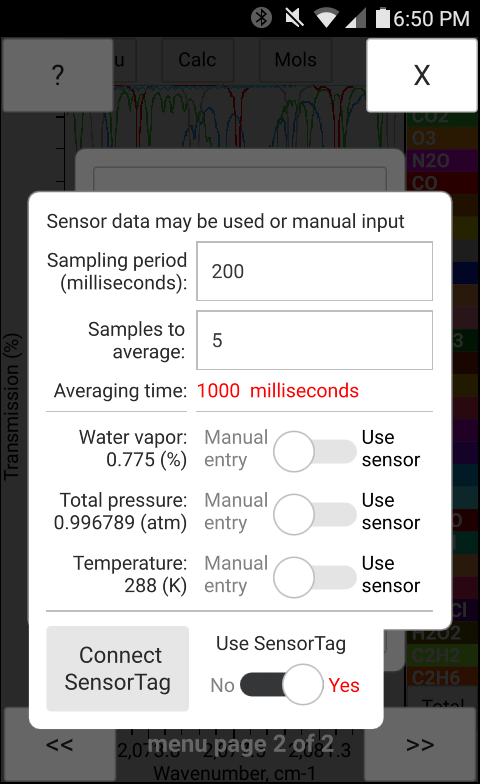 Bytran is able to access cell phone built in sensors however this support is limited to the thermometers and barometers under the Android operating system due to the present limitations of the Qt environment. Future bytran editions will likely include custom code to suppport the iOS operating system and the humidity sensor. A search of cell phones with a barometer, thermometer and/or humidity sensor may be performed here. Starting with version 1.3 bytran supports the Sense HAT add-on board for Raspberry Pi to measure ambient total pressure (LPS25HB, accuracy of 10 to 100 Pa), temperature (HTS221, < 0.5 °C accuracy) and humidity (HTS221, < 3.5% accuracy) for input into the line-by-line calculations instead of the manual entry.